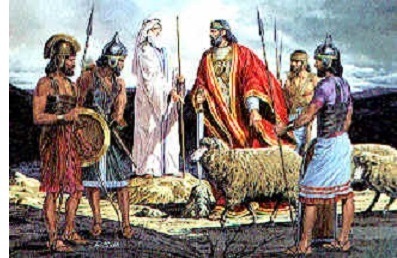 Samuel rebukes Saul - As Saul's reign progressed, he began to disobey the will of the Lord. Initially, it brought mild rebukes from Samuel and Jonathan, but eventually it got to the point where the Lord rejected him outright as king. It came when the Lord ordered Saul to battle the Amalekites and completely destroy them and all they had in order to punish them for what they had done to Israel. Saul defeated the Amalekites, but failed to carry out the Lord's order in its entirety (I Samuel 15:1-9).